Back in the late 70s and early 80s, independent record labels in the UK were two a penny and only a few were worth their salt: Rough Trade, Postcard and 4AD pushed a few boundaries with packaging as well as with the all-important music, but in North-West England another label, Factory, was making an impression with its unique and minimal sleeve-art and rain-soaked post-punk sound-scapes courtesy of Joy Division (and ultimately New Order), Section 25, A Certain Ratio and Durutti Column. Meanwhile, similar creative in-roads were being made in the modest Lowlands country of Belgium, courtesy of a less-publicised but no less-interesting 'cold-wave' scene that was more advanced than that of its neighbours. Les Disques Du Crépuscule was formed in 1980 by Brussels scenesters and gig promoters, Annik Honoré and Michel Duval. Their remit seemed simple - to emulate the DIY attitude of UK labels like Factory, Rough Trade and New Hormones whilst retaining an air of artistic individualism, not least with the sleeve artwork provided initially by Benoit Hennebert (an in-house designer with clout, much like Factory's Peter Saville). The label established itself with engaging vinyl releases from Cabaret Voltaire, Bill Nelson and Josef K until its peak period began really take hold in 1982. Armed with an enviable roster and with Post-Punk almost officially over, Crépuscule admirably refused to buckle to trend and became a haven for many like-minded artists who saw past the New Romantic vision of major-labels. Antena, Paul Haig, Blaine L.Reininger and The Names became early signings and proved to be the small tip of an ever-growing iceberg of releases. The label eventually progressed into the arenas of pop, avant-garde and classical with releases from Anna Domino, Jane Kelly-Williams, Wim Mertens, Devine and Statton, Kid Montana, Isiro, Marie Audigier, Cathy Claret and even iconic 'Moonlighting' actress Cybill Shepherd singing jazz-standards with legendary sax-maestro, Stan Getz. The curator for 'After Twilight' is electro-samba and bossa-nova singer, Isabelle Antena, a prolific artist for Crépuscule who released a classy series of pop and jazz albums that sold around a million copies in Japan, although met with comparative indifference in the UK and most of Europe apart from Spain and France. The aim of this project is pure and simple. Isabelle takes up the story: "With 'After Twilight', I wanted to re-unite the artists with their songs again and the only way to do that was to re-record them. I contacted the other performers from the Crépuscule Japan Tour - Anna, Cathy and Jane (Kelly Williams - graceful country-folk singer from the US) - and they all agreed with the idea of the project. Regrettably Jane couldn't commit to this volume - but there is always 'Volume 2'! I didn't just want female singers on the album so I approached some male allies in The Names, Paul Haig and Blaine L. Reininger, with whom we had also toured with (in 1982 on the 'North-South Dialogue Tour'). They were only too pleased to re-visit old songs as well as contribute new ones." LTM present a compilation album of new recordings by artists who recorded for stylish European indie Les Disques du Crépuscule. 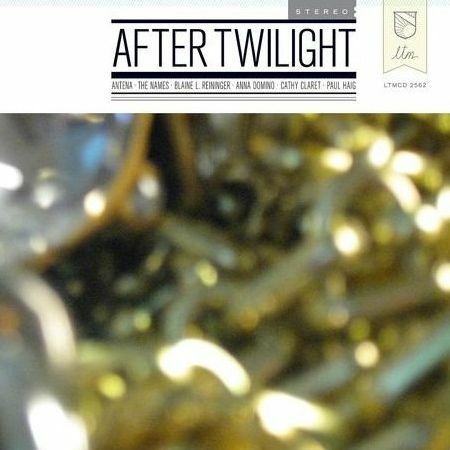 Featuring contributions from Antena, Anna Domino, Paul Haig, Blaine L. Reininger, Cathy Claret and The Names, After Twilight features several brand new songs as well as modern updates of favourite back-catalogue tracks. Part nostalgic reverie, part retro-futurist nod, the album was executive produced by electro-samba pioneer Isabelle Antena, and seamlessly mixed by Denis Moulin. The booklet features cover art by noted designer Andrew Prinz, as well as comprehensive liner notes by Paul Pledger.